I was a junior in high school, and I was impressed. My wallet, full of my parents’ money, would be a small price to pay for such a spectacular show. I thought back on this recently when the City of Middleton posted a massive, neon orange message on an electronic sign just off Highway 14. 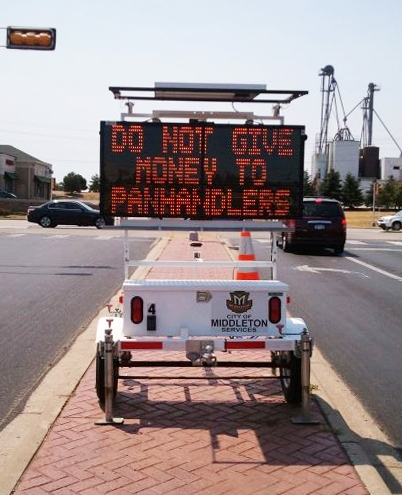 “DON’T GIVE MONEY TO PANHANDLERS,” it instructed citizens, citing city ordinance 7.05. As far as I can tell, the sign ignited anger in exactly one person – in a community of 17,555 people. I sent an email to every member of the city council asking about it, but none of Middleton’s eight alders thought the issue worthy of genuine discussion. Once again I was reminded that Middleton is really two cities. To most who live in Madison or the countless small towns and villages throughout the rest of Dane County, Middleton is a community bound together by something entirely different: a common love of exorbitant wealth. I admit I consider it my civil duty to give the local government a hard time. Yet I often stick up for Middleton. I’ve run the community’s newspaper for seven years now. In that time I’ve met countless good people. Normal people. Diverse people. Good, generous people. When no one cared about a city sign prohibiting people from giving to those in need, these people vanished from public view. The prevalent image of Middleton – the place so often mocked by Madison and other neighbors - came roaring back. The fault lies not with the police. They must enforce the laws on the books. The problem is with the sign itself, and with the 17,554 people who - somewhat inexplicably - aren’t bothered by it. The Democrat in you should be offended because your entire political platform is based on the premise that you are not a jerk. The Libertarian in you should be offended because the government has no right to tell you who you should, or should not, give your money to. The Republican in you should be offended because this flies in the face of all 180,552 words in the New Testament, a book in which a man without a home or a job (the text never says Jesus was a “carpenter,” by the way), goes from town to town telling people to share. Most offensive of all is the idea that we must only give to those in need through an intermediary. Giving to churches or charitable organizations is fine, but giving to a single human being has its own inherent merits. Plus, countless people and organizations take my money without my consent on a daily basis. Some do it for good. Others for evil. The federal government pockets my money to pay for military drones that kill civilians. Local government takes my money to pay for roads, schools, and ironically, to pay handsome salaries and benefits to the people who put up signs imploring us not to give money to panhandlers. Every day, I have to pay with my tax dollars for the misguided gambles of corrupt bankers. Every day, I have to pay so that attorneys can line their pockets. I am forced to give tax breaks to the rich in the form of Tax Increment Financing. Even factory farmers, who seem so quaint, steal from me as my tax dollars subsidize their economically unsustainable business models. The sign in Middleton came in response to one man. At least, unlike everyone else, he had the decency to ask for his share. At least he looked us in the eye when he asked for our money. When I drove by, I had the chance to say “no.” Despite the city’s silly law, I had the moral right to say “yes” as well. So I’m not going to ask the city to change its ordinance. That would be a waste of ink and time. What I will do is ignore the city’s rule. When I was in college in Florida, I worked at a restaurant that featured Italian food, mediocre service (you’re welcome) and, as it turned out, faulty electrical wiring. It was located on a beach. Eventually a “bum” made his way to the back door. When my boss found him rooting around in the dumpster, he offered some leftover food from the kitchen. The man returned every night at closing time, sand bounding from his blue backpack as he lowered it to the ground. At his side was a black dog. She was Labrador-ish, with a bandana around her neck, like the mutt I think is issued, along with a slightly unbelievable story of woe, to every person who ends up without a home and without a job. I was always struck by how happy she was. How without shame she munched on the stale dinner rolls her human companion handed her out of the foul depths of the green metal garbage receptacle. She had no chance of landing on a Money magazine list, but it didn’t seem to bother her. Nor did it bother her owner. One night, as my boss brought out yet another slightly burnt lasagna (this dish cooked in an unpredictable manner in its ceramic dishes), the homeless man looked him straight in the eye. He wasn’t demanding anything. He was asking, which is all panhandling is. That night, and many nights after, the man and his dog returned and ordered a free meal. The cost, in raw materials, was around a dollar or two, according to my boss. No church, no government, and no charitable, tax-exempt organization was needed. Middleton’s neon sign scolding citizens for giving to the poor should be ignored. It’s a great opportunity to follow the advice of Thomas Jefferson and Henry David Thoreau, both of whom said it is our obligation as citizens to break unjust laws. And if the City of Middleton decides to approve an ordinance that prohibits me from catching babies thrown in my direction? I’ll ignore that too.